In September I visited my daughter in New York and was entranced by three attractions - all of them free. Here's one of them. One of the glories of modern New York is the High Line, a former elevated railroad, running through what was the industrial West Side of Manhattan, built in the 1930s, abandoned from the 1980s, left to run wild and now landscaped and converted to a high-level, linear park – a rambunctious one-mile streak of flowers, shrubs, grasses and greenery, winding between apartment blocks and former warehouses and factories, thirty feet above the streets. The view from a railway is often of the hidden, back side of things, the parts of the city not intended to be on show, and this is no exception. One moment you are walking tight against the wall of a former warehouse, the next close by the windows of housing – too close for what seems like comfort. Where once side-lines ran into warehouses at first-floor level (second-floor American style) carrying meat, milk, raw materials and manufactured goods, now the High Line’s spurs hit brick walls. At the north end, still to be incorporated by a further phase of the park’s development, are the rail yards. Along the Line there are art works, coffee and food stalls (all utensils and packaging have to be recyclable), performers and, a rarity in New York, a public ‘restroom’. You look down on, not across, the street junctions and eye-ball the giant bill boards, now aimed at both walkers and drivers. 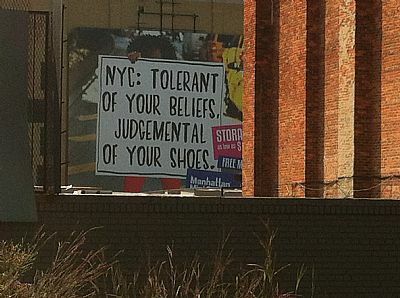 NYC: Tolerant of you beliefs, judgemental of your shoes reads one; Stop praying. God’s too busy to find you a parking spot says another. 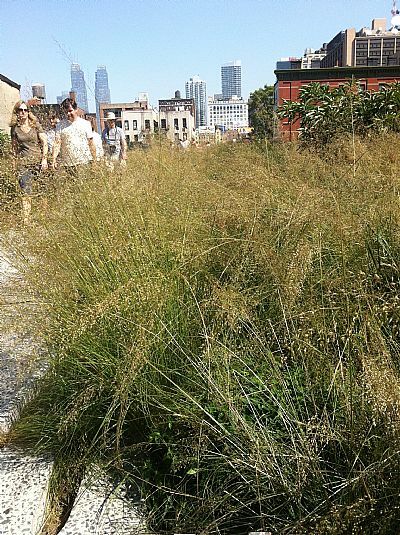 The success of the High Line is also a story of community action, the brainchild of two local residents, Joshua David and Robert Hammond, who began campaigning in 1999 for its preservation and re-use as open public space. Thirteen years later they have given New York one of the most innovative parks on the planet.